This is a simple but clever piece of electronic wizardry for any drummer or percussionist, and is a cost-effective way of expanding a kit. No misfires/accidental triggering in our tests. Easy set-up. 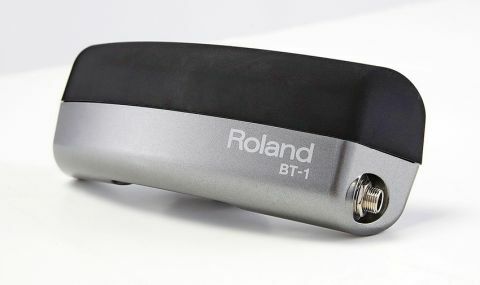 The Roland BT-1 is a bar-type trigger pad that is designed as an add-on triggering device for any electronic drum module or sampler. It can be used for a host of applications including to start/stop a sequence or a song, and to trigger any additional sound from any other source. It can be integrated into any acoustic or electronic set-up, or used to create a hybrid of both. The body of the BT-1 is made from a tough, impact-resistant plastic with a gunmetal finish, topped by a 30cm thick rubber compound which is intended to be hit with the shoulder of a stick. It is designed to bolt onto any electronic drum pad (via tension bolts), or any acoustic drum of between 8" and 18" in diameter. Roland provides a bracket so the BT-1 can also be clamped onto an L-arm rod of any stand. "Its slightly rounded shaped allows it to nestle comfortably around almost any drum, be it electronic or acoustic"
Its slightly rounded shaped allows it to nestle comfortably around almost any drum, be it electronic or acoustic. Its shape actually matches the curvature of the rim on my 16" floor tom pretty much exactly. Mounted on a standard rim, it sits approximately 30cm proud - basically the whole rubber section sits above the rim, so there is plenty of the BT-1 exposed to wallop. The really nifty aspect of the BT-1 is the cross-talk cancelling electronics inside. This has two Piezo- type transducers coupled with a ribbon running along the length of the unit. These work in conjunction with each other, allowing nothing less than a direct hit to trigger a sound. For this to work correctly it is essential to use the supplied lead or a stereo terminated with a 1⁄4" stereo jack. Attaching the BT-1 onto the tension rod of any drum couldn't be easier; remove the tuning bolt, position the unit then do a quick tune up (on the acoustic kit). We attached the BT-1 to a snare - this should be the acid test: if we are going to experience cross-talk, it is going to be here! With the supplied lead connected to our sampler, a quick wallop immediately triggers the chosen sound or halts a particular sequence. The BT-1 is velocity sensitive, sending more than just a simple on or off - it does require a fairly hefty shoulder strike, but it does appear slightly more sensitive towards the jack socket end of the bar. It does the job without fear of accidental triggering, misfire or starting a sequence by mistake.